The purpose of the Alumni of the Year Award is to recognize outstanding achievement by the men and women of York College. The purpose of the Young Alumni of the Year Award is to recognize outstanding achievement by the men and women of York College under the age of 40. Only graduates of York College will be eligible. The nominee shall have distinguished him or herself in their chosen professional field of endeavor. The nominee shall have made significant contributions to his or her community, on a local, state, national or international level, in professional, humanitarian, or ministerial endeavors. The nominee shall have demonstrated integrity in his/her personal life and gained the respect of those surrounding him/her. The nominee shall have demonstrated a belief in the mission and purpose of York College. Nominations may be submitted by anyone associated with York College. All nominations must be submitted by April 15 via the York College website. Final award selection will be determined by a panel of current York College employees. 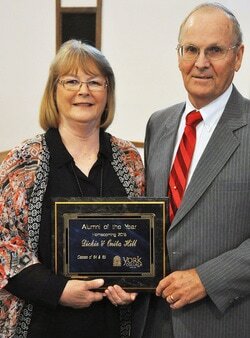 The award shall be presented during Alumni chapel Homecoming. It is preferred that recipients are present for the award presentation. The recipients will be announced before the date.